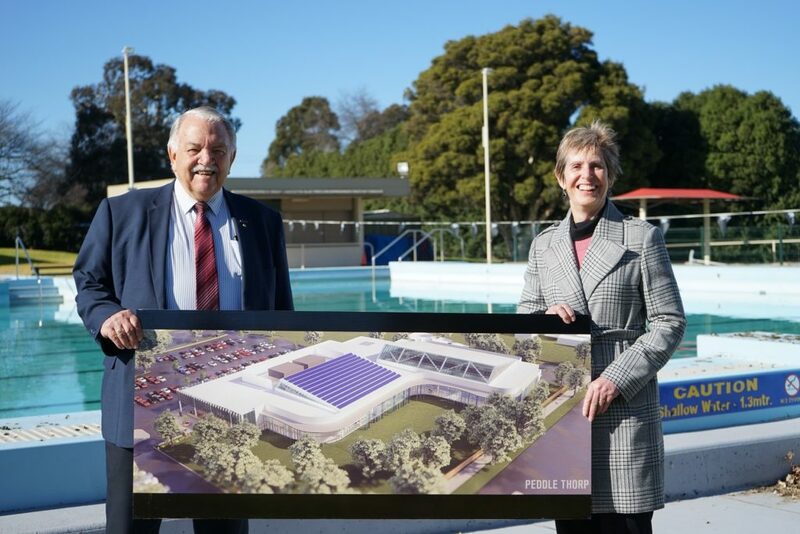 Latrobe City Mayor Darrell White OAM and Latrobe Valley Authority CEO Karen Cain show off concept images of the proposed Gippsland Regional Aquatic Centre. Designs and concepts for the $46 million Gippsland Regional Aquatic Centre and $17 million Traralgon Sports Stadium have been revealed, giving the community a first glimpse at the much anticipated major infrastructure projects. Latrobe City Council Mayor Darrell White and Latrobe Valley Authority CEO Karen Cain today unveiled architects’ early plans for the State Government funded projects and announced the 16 July opening of design and construct tender periods at the GRAC site. The concept plans for the Gippsland Regional Aquatic Centre, produced by architect Peddle Thorp, feature an eight lane 50 metre indoor pool complete with 500 seats for spectators. Current designs also include an indoor water play zone, warm water pool, designated learn to swim pool, spa and sauna areas, a wellness centre, café and retail precinct and wet and dry change facilities. Early concept plans for the GRAC. 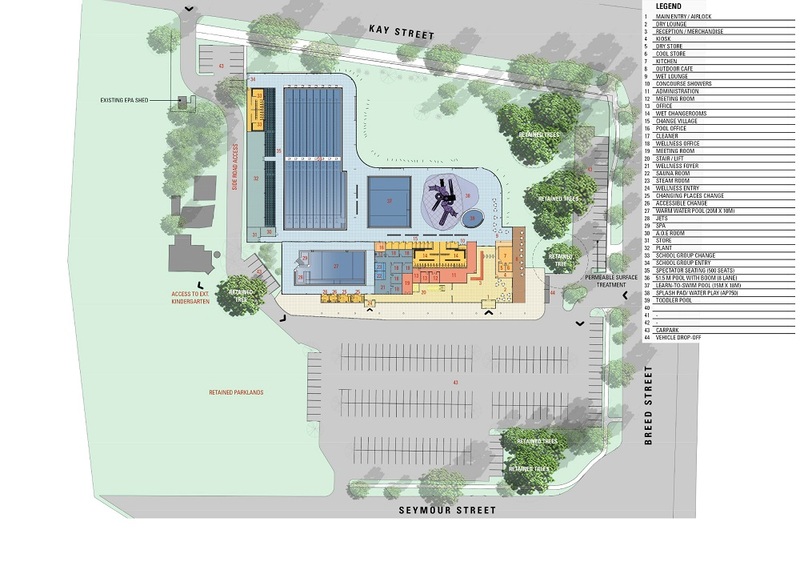 Experienced companies ADCO Constructions, Cockram Construction Ltd, J Hutchinson Pty Ltd and Ireland and Brown Constructions have been invited to take part in a shortlisted tender process for the aquatic centre. Concepts for the $17 million upgrade to the Traralgon Indoor Sports Stadium detail a four-court extension to the existing facility, complete with a new show court, spectator seating and associated amenities. Becon Constructions, BFN Developments, J Hutchinson Pty Ltd and Ireland and Brown Constructions are the shortlisted candidates for the TSS tender. Both projects will use 90 per cent local content as designated Victorian Industry Participation Policy (VIPP) initiatives. Under the Victorian Government terminology for VIPP, local content refers to Australia and New Zealand. Latrobe City, LVA, ICN and Gippsland GROW are all working to maximise opportunities for Gippsland companies to be involved in the GRAC and Traralgon Sports Stadium projects. The GRAC and TSS developments are funded by the $85 million Latrobe Valley Sports and Community Initiative, administered by the Latrobe Valley Authority. Quotes attributable to Latrobe City Mayor Darrell White OAM. “Having invested considerable time understanding our community’s needs, wants and concerns it’s time to move into the next phase towards making it a reality. The GRAC concept plans cater for all ages and ability levels—a true and full reflection of our community now and into the future. “As well as servicing the local community and nurturing young talent this facility will position us to deliver major events within Latrobe City. With the tender process underway, I expect the announcement on the awardee by the end of the year with construction to commence in mid-2019. Quotes attributable to LVA CEO Karen Cain. “We are committed to the timely delivery of these key projects for the Latrobe Valley and this comes as a major milestone in that process.